This was the last big stop on our spring roadtrip. We had no plan, except Aaron had never visited the Wallowas and he wanted to check it out. Although most of Oregon had a low snow year, the Wallowas seemed to still be buried in snow. Wanting to learn more about current conditions and access, we stopped into the Pine Field Office near Halfway in the southern part of the forest. This was the least heavily visited part of the much beloved Wallowas. I wasn’t sure what to expect from the rangers but we figured we’d give them a chance. Much to my delight, there were two women working the desk: one young lady who first greeted us and seemed new to the job, and an older woman hiding in the back. The older woman emerged when she heard our long list of questions and she was incredibly helpful in answering them. She sounded like she was out on the roads and trails frequently (a rarity among rangers I’ve met at the ranger stations) and had decades of knowledge accumulated from working and living in the mountains. When we said we wanted to climb up to see some views, she pointed us to the East Eagle trailhead. After describing the best driving route, she explained that the Little Kettle Creek trail would lead us up a bunch of switchbacks to an amazing view of the mountains. We could stop and turn around at any point, but we surely couldn’t take the trail all the way to Crater Lake due to the snow. When we arrived at the trailhead, Aaron got packed up for a 6-mile hike. In my head, I’d already decided that we were going to press on through the snow to find the lake. I hadn’t shared that little tidbit of information yet. As I packed up for a 12-mile snow adventure, I broke the news to him. I rarely see Aaron put on a grumpy face, but I sure was treated to one today. I said, “well, we’ll see how far we feel like going,” knowing that I was hell-bent on making it to the lake. Off we went, up a steep, dirt track that seemed to lead to nowhere. “What the…?” Already we were bushwhacking and confused. After some mucking around, we found the actual start of the trail and began hiking up. The trail climbed, and climbed, and climbed up a series of steep switchbacks. We huffed and puffed for breath and quickly warmed up. As we ascended, we began to get views of the beautiful mountaintops. I knew it would be worth it. I still don’t think Aaron was convinced. He charged up ahead, I could barely keep up. My lungs were straining, my legs not cooperating. I felt totally off today. As we silently walked through the forest, we were startled by a pair of equally startled elk. We saw their huge backsides as they bounded out of view. I don’t think either of us had come so close to elk in the forest. I thought maybe that would help win Aaron over. Eventually we left the bare ground behind and began to cross larger and larger patches of snow. Aaron was at least prepared with his Yaktrax; mine were buried in the car somewhere. I slipped and slid right behind him as we continued up the snow. All signs of the trail disappeared, and we switched to navigation by geographic features and the map. At the bottom of a basin, it was not entirely clear which way to go, and where exactly we would find the lake. So we took a gamble and committed to climbing up a wide snow ramp to a nice viewpoint. From there, we peered down on what looked like a body of water. We both said: is that the lake? Are we done? But we both thought: that’s definitely not the lake. Tired from all our snow slogging, we regrouped and made a plan. According to the book, the lake should have been about a quarter mile past the ponds. We could do that. We kept going. It was the longest quarter mile in history, but we emerged from the trees to gaze upon a large, snow-covered lake. A ring of bright blue snow melt encircled the lake. It was stunning. I dropped my pack to explore, take pictures, and soak in the experience. It was worth every step. As we turned to retrace our snowy footprints back to the trail, we relaxed a bit and settled into a comfortable pace. Crossing the rocky plateau, we stopped in our tracks when we heard rockfall. I scanned the cliffs above us and saw…goats! There was a herd of mountain goats tooling around on the rocks. We watched them for a bit, wishing we had binoculars. So far it was one of our best animal sighting days! Walking downhill was a dream. We could really enjoy the scenery around us. We hadn’t seen a human all day. Hiking in solitude, in one of the most picturesque places in Oregon, turned out to be an incredible last chapter in a memorable trip. I am so grateful to have a partner who is always up for a crazy adventure, who is adaptable, willing to walk forever in the woods, and willing to drive long distances just to find our own quiet piece of the world. 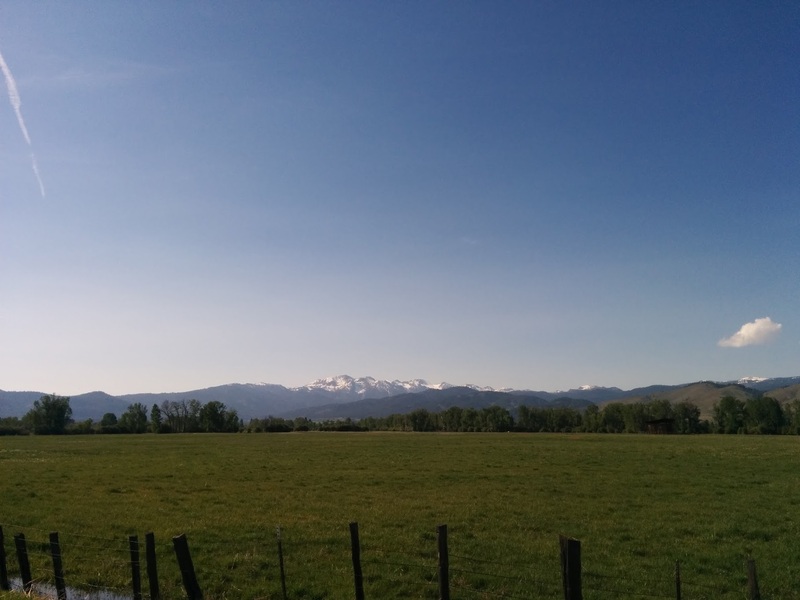 This entry was posted in Four state parks tour 2015, Hiking, Oregon on May 27, 2015 by Jess B.
April 30 – May 1, 2015. Our last stops in Utah were west of Salt Lake City. 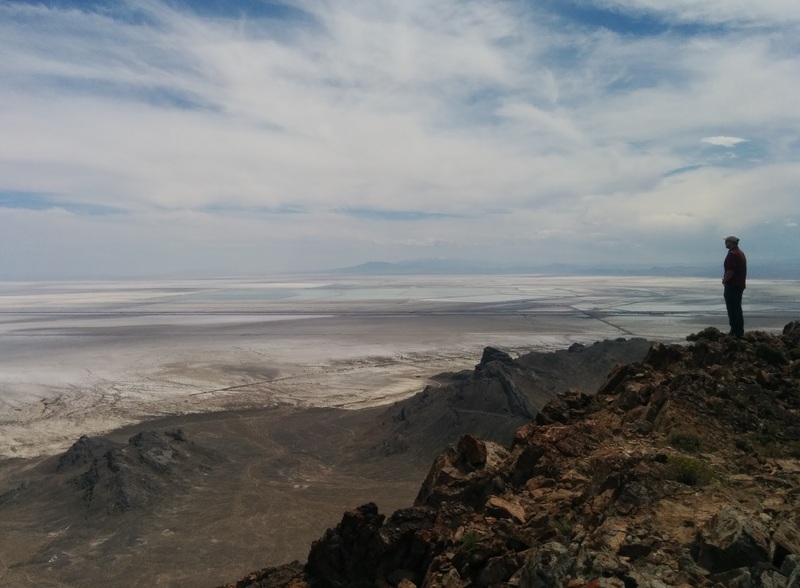 When researching possible trip destinations, I noticed that a nice route would take us by the Bonneville Salt Flats, famous for the land speed records set there. Also, as I would later learn, infamous for bogging down the Donner-Reed party in their race against the oncoming winter storms as they headed for California. Just nearby were the Silver Island Mountains, a place I’d never heard of before. But on the map it appeared to be an interesting place to explore. According to Summitpost.com, it was. So I copied some notes about a few climbing routes and off we went. We arrived at the salt flats after a long day of driving. A work crew was setting up a huge tent for some event that was happening the next day (we never found out what it was). But the Wikipedia page mentioned that the Bonneville Salt Flats hosted several races, movie shoots and other events year-round. We parked past the tent-raising and walked out onto the salt. It felt good to stand up after being driven around all day long. Shallow pools of water collected in some parts of the salt flats, which seemed unusual. We carefully walked around on the hard and surprisingly uneven ground, looking for interesting salt formations. We’d been spoiled by the intricate salt statues in Death Valley a few years ago, so this place seemed pretty ho-hum in comparison. It was getting to be dinner time and we needed to find a place to camp so we headed to the scenic byway encircling the Silver Island Mountains. It was all BLM land; we just needed to find a nice spot to pitch a tent. And that we did. We found someone’s old fire ring just a little ways off the main road and decided to stop there for the night. We had an elegant meal of roasted asparagus and Dinty Moore Beef Stew. A camping classic. The dramatic sunset over the mountains behind us made it worth all the day’s driving. Although we could see the traffic buzzing by on highway 80 far off in the distance, it felt as if we were sitting in a remote getaway. The next morning, we awoke to a spectacular sunrise and then headed off to our first destination: Volcano Peak. We did our best to follow the description of the drive to the recommended route, stopping a few yards short due to rough road conditions. The climb was straightforward: follow a gully to a ridge, stay to the left, and then head straight up from there. It took us less than 45 minutes from car to summit. 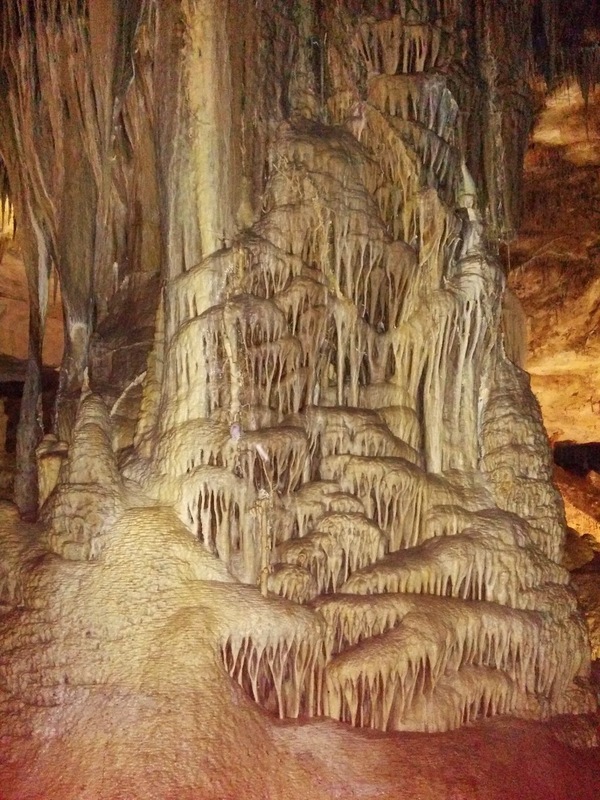 The mountain was made up of interesting rocks with streaks of colorful minerals. We poked around for a few minutes until I stopped in my tracks. I yelled over to Aaron. Two bighorn sheep were standing on a ledge just below me. The mother sheep’s eyes locked with mine as her tiny baby bounced around her feet. The baby was adorable; the mother terrifying. We watched them as they held their ground on the ledge, and then they decided to retreat to a safer place elsewhere on the mountain. They remained visible from our summit perch, so we spent the next half hour watching them do their sheep thing. It was so quiet up there. Never had 45 minutes of work felt so rewarding. But, we had one more peak to go, so eventually we took our parting shots and tromped back to the car. Next in line was Rishel Peak. We could see it clearly from Volcano Peak, but it was less clear where the Summitpost author wanted us to start this next route. We made our best guess, parked the car adjacent to a rough dirt road, and started walking. All we had to do was get close enough, pick a good line, and head up the mountain. Out here, routefinding was easy. You could see the entire lay of the land from nearly every point on the land. There were no silly trees in the way. There was evidence of human activity along the way. Old, rusty bits of metal, broken glass, and other items lay on the desert floor, cast away decades ago. But we didn’t see any other humans out here. There were plenty of lizards to keep our attention. They were fast, scurrying away quickly when we got anywhere near them. This route was much more of a gradual climb. We wandered across a flat, brushy plain, then snaked up a broad ridge punctuated with rocky outcrops. Eventually we popped up on the main summit ridge and followed it until we couldn’t go up anymore. Views were killer, just like on top of Volcano. In our poking around we found some old telegraph wire and wondered what the stories this peak held. The clouds seemed to be thickening and turning grayer, so we descended with the intention to move a bit more quickly. They never turned into storm clouds, but it was better to be safe than sorry. The Silver Island Mountains Scenic Byway is a 54-mile loop of rough dirt road that loops around the Silver Island Mountain range. Aaron wanted to drive the whole loop, so we loaded up some podcasts and hit the road. The road just went on and on. Along the way we passed a couple of road signs indicating that we were crossing the Hastings Cutoff on the California Trail. This was where the Donner Party took a tragically long short-cut that ended up getting them stuck in winter storms in the Sierra. We marveled at just how harsh the life of the pioneers must have been, munched on some chocolate covered almonds and turned up the AC. That night we headed for the border. We drove through the little casino town of Wendover, NV and started north for Idaho, with the intention of camping somewhere on BLM land. Somehow we got talking about hot tubs and buffets and decided to book a room in the next casino border town. There was only one room left on this Friday night and we grabbed it. We gorged ourselves on crab legs and other buffet goodies, and got one hell of a night’s sleep on an actual bed, the first we’d laid on in weeks. 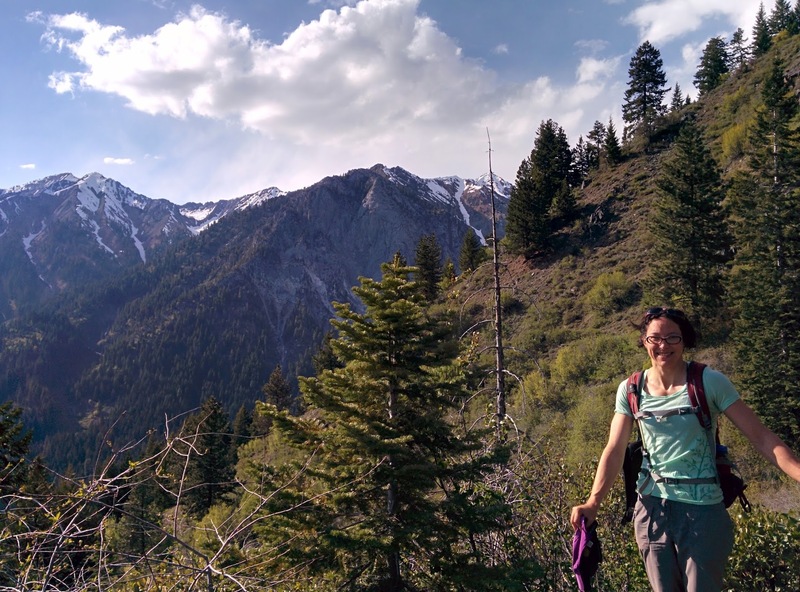 This entry was posted in Four state parks tour 2015, Hiking, Utah on May 17, 2015 by Jess B. From Bryce Canyon, we headed for Kodachrome Basin State Park. It earned its name from a 1948 National Geographic Expedition to the park. They were thrilled to be able to present the spectacular colors of the park on brand new Kodachrome film, or something like that. Had these journalists visited, say, any other wild place in Utah they would have realized that this park was not exceptionally colorful. On the way, we made a quick detour to Grosvenor Arch. It’s not really on the way to anything, but it seemed like a worthwhile diversion. After much driving down gravel roads we pulled into the small parking area and took a short walk to the base of the arch. This arch, also named by the National Geographic Expedition, stands over 150 feet high and stretches 92 feet from one side to the other. Its double arch formation is unique, even among Utah’s extensive arch collection. A quick 10 minute leg stretch here, then it was off to find a campsite. We didn’t want to pay to camp at the state park, of course, so we found a little dirt pull off and camped among the sage. The wind attempted to blow us off the face of the earth but we persevered, and even had enough energy to make chili dogs before retreating to the shelter of the tent. There was at least a half day of adventure waiting for us at the park. We began on the Panorama trail, a 6-mile loop that passed by several named formations and would serve as a good introduction to the park. Nearly the whole loop was exposed to the sun. Although it was cool for our 8 am start, I knew it would turn hot fast. Signs in the visitor’s center and throughout the park educated us about the geology and wildlife here. We were mindful not to step on the cryptobiotic soil due to reading the “don’t bust the crust!” signage. These special soils, essential to the desert ecosystem, are sculpted and held in place by tiny microorganisms like cyanobacteria. The organisms can help the soil retain moisture and resist erosion. But they are terribly fragile, so stepping off trail was a big no-no. Staying on the trail, we observed several rock spires, colored in browns, yellows and reds. We saw cactus, wildflowers, and hardy desert shrubs. The trail mostly passed through wide plains dotted with vegetation, but in a few areas we squeezed between rock walls and negotiated sharp turns that avoided trees, seasonal streams and rock features. A couple of spots were remarkable, but the loop as a whole was pretty ho-hum. Cool cave, which wasn’t really a cave at all, was an interesting rock feature with tall walls. The floor was hardened mud, and it looked like at any moment the walls could come sliding down. Indian Cave, also not a cave, and not even on the map, was the second feature of note. Its walls were scarred with what looked like numerous deep hand prints. It must soften considerably when there’s any rain so that people can create hand-shaped scars in the rock. At least that’s my best guess. Although there was a sign for ”Indian Cave,” and yes, the quotation marks were even on the sign, it was not indicated on the map. Curious. After that, we took a half-mile jaunt on the Nature Trail. Short but sweet, this trail was packed with informational signage that went into detail about the native plants and human history. It was a pleasant hike and I enjoyed the educational aspect as well. But now it was hot, we were hungry, and it was time to eat. I dug into the cooler and built a nice plate of tuna salad and we purchased some cold drinks from the General Store. We finished up with an ice cream bar and then made one more stop: Chimney Rock. This was another ho-hum stop, but the surrounding scenery was quite, well, scenic. Cotton ball clouds floated across the bright blue sky. It was only a brief stop. We said farewell to the park, since there was some driving to do to get to our next spot: Capitol Reef. 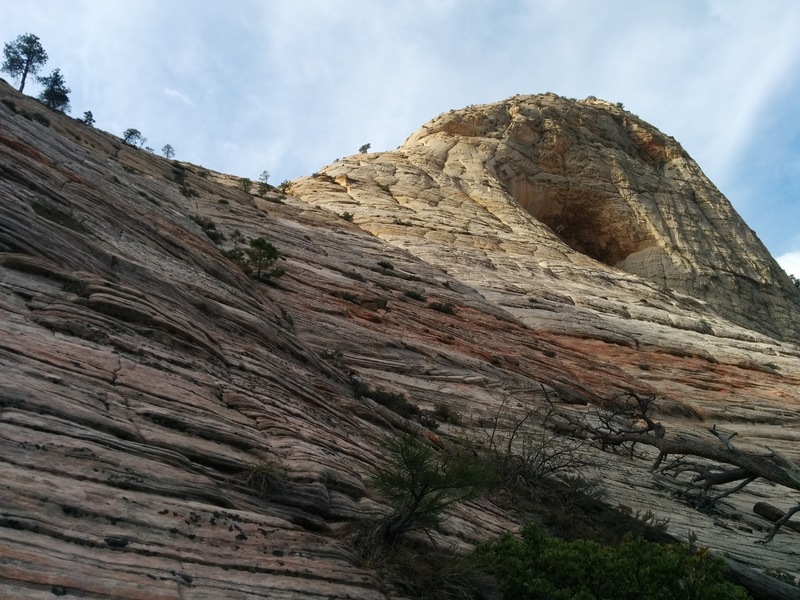 This entry was posted in Four state parks tour 2015, Hiking, Utah on April 29, 2015 by Jess B. View the photo album from Bryce here. We rolled into Bryce Canyon well after dark, with no camping reservations and a low level of patience. We found what was likely the very last open site in the whole park at Sunset Campground. We quickly set up the tent, crawled inside and immediately began hibernating. In the morning we made a hearty camp breakfast, bundled up and prepared for a day on the road. Most people visit Bryce by car. In a half a day, you can drive the length of the canyon, pop out at each of the viewpoints, take a few selfies and be back in town well before dinner time. We thought we’d take the drive to get an overview of what was available, then do some hiking. The drive was lovely. We drove out to Rainbow Point at the south end of the park and worked our way back. Each stop provided a different view of the park. We saw hoodoos, natural bridges, and colorful, banded rocks. On this day the clouds were gray and threatening. We stood in a few brief snow squalls. This was much different than Zion. 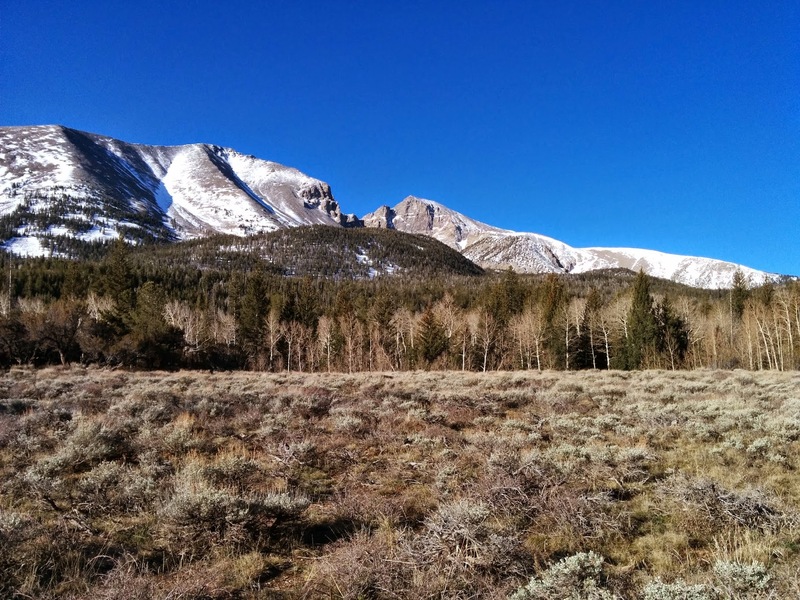 We did hike the Bristlecone Loop early in the day but it was unremarkable. The trail was boring, not very scenic, and short. Any other hike in the park would have been a better choice than that one. The first time we really set out for a hike was the walk to the Hat Shop. The trail descended from the canyon rim at Bryce Point, following several switchbacks down towards the river. We passed by a trail crew on their lunch break. Tools were scattered all over the side of the trail. It looked like terribly difficult work in the heat of the afternoon. We trotted happily by. About 2 miles down, we began to see our destination. The Hat Shop earned its name from the series of orange hoodoos topped with dark gray rocks. They looked like they were each wearing a little hat. As we walked down the trail, more capped hoodoos came into view. We found a large, twisted tree just off the side of the trail that served as a snack spot and provided a little shelter. After spending all morning around cars and tourists, it was nice to get out into what felt more like wilderness. The downside of canyon hikes is that the tough part comes on the way back. We walked back uphill into the crowds of people taking photos to post on Instagram, and headed back to camp. In the morning, we drove to Sunset Point for a bit of a longer hike. 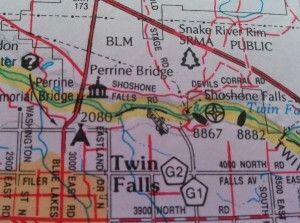 The Figure-8 Loop, as it was known, included the Queen’s Garden, Navajo Loop and Peekaboo Loop trails. We began descending under a layer of thick clouds. The trail drew us down into narrow-walled canyons where a surprising number of tall pine trees grew. In some sections of trail, the rock seemed to enclose us completely; in other areas, the rock opened up to expose panoramic views of the park. Along the way, we passed some dramatically named features: Thor’s Hammer, Wall of Windows, the Cathedral, Queen Victoria, the Sentinel. Many other interesting features had yet to receive any compelling name. We appreciated them equally. I thought this frozen mudslide was one of the cooler things we saw along the path. But just like children, I’d imagine, it was hard to pick a favorite. The eastern half of the Peekaboo Loop was relatively quiet. It was the furthest away from the parking area and passed by no named features on the map. It had clearly been visited, however, by tours on horseback. The stench of horse poop filled the air. It covered the trail, too, and made the whole deal feel quite unpleasant. I’m one of the few that thinks horses and hikers aren’t compatible trail users. It was no matter, since the trail passed by such amazing scenery it was easy to ignore the masses. We walked past gnarled trees, painted hills, vast views, and curious hoodoos. Even the half-mile walk back to the car on the rim trail was enjoyable. After the hike, we still had half the day ahead. We chose to head to the General Store, which had showers and laundry available. We took advantage of both. While waiting for our laundry to dry, we wrote postcards, played Quirkle and made plans for the remainder of our trip. It was actually a very nice way to spend the afternoon. We would be on the road for nearly three weeks, and this was our first of only 2 showers on the trip! Who could pass up a trip through something named Fairyland Canyon? Apparently, a lot of people. We saved the best for last on our final hike in Bryce Canyon. We began the loop from Fairyland Point, which is located at the end of a spur road that had no shuttle service. Already it felt more isolated than the other viewpoints in the canyon. Just like the other hikes, it began by climbing downhill. We’d gotten pretty used to the view by this point: orange and tan rock walls, hoodoos and other geologic features. There were bristlecone pine, Ponderosa pine, manzanita, and a few colorful wildflowers. But what made this hike special was the neverending diversity of sights to see along the way. Around every corner, a new surprise awaited us. It was difficult to travel at a steady pace because I stopped to take a photo every few minutes. The landscape was never short of stunning. We stopped at the Tower Bridge viewpoint for a quick lunch, working hard to keep our sandwiches away from the circling chipmunks. From there, the ascent began past the China Wall and back up to the canyon rim for the 2.5 mile walk back to the car. On the way we passed another “Hike the Hoodoos” checkpoint, where we stopped to take an exuberant picture. Actually it was more like 20 pictures, until Aaron got the timing right. Needless to say, my splits were feeling easier by the time he nailed the shot! Driving back to camp, we saw a few pronghorn on the side of the road. While these were pretty common out in the desert, it was a rare sighting for us valley residents. We stopped and watched them for a few minutes before taking off. 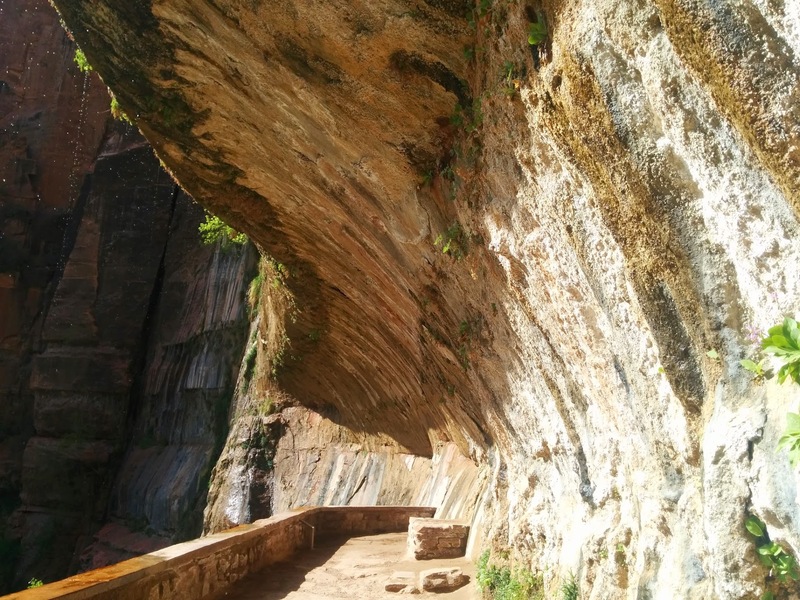 This entry was posted in Four state parks tour 2015, Hiking, Utah on April 28, 2015 by Jess B. View the photo album from Zion here. We went to Zion for one reason: to climb North Guardian Angel with my friend Rick. But we had a couple days to kill before the climb, so we took on all the popular hiking trails in just a few short days. After a quick evening stay at the Watchman Campground, we packed up and left early to grab a campsite at South Campground. Camping was kind of a nightmare here; by the time we rolled in, almost everything was full. The ranger at our entry point mentioned that sites tend to open up in the early morning when people leave, and we’d have a good chance at snagging one if we vultured around the campground around 8 am. That proved to be a good strategy, so once we found a site we were able to get out and go hiking. The hike up to the best viewpoint in the park started out in the most annoying way possible. The trail is paved for most of the way, and apparently it was being maintained by some sort of trail Zamboni. This loud machine was grinding up the trail not too far behind us, traveling at roughly our pace. We just couldn’t get away from it. Eventually the pavement became more and more broken up and the Zamboni came to a rest, leaving us to ascend in blessed silence as we approached Echo Canyon. We continued into the canyon, then climbed right back out of it and into the sun. We hiked up and up, noting the unfamiliar desert vegetation as we climbed. Paintbrush sprung from the canyon walls, yucca and cactus threatened to poke us with their spiny leaves, and desert primrose cowered in the heat. We admired not only the tiny plant life but also the huge vistas and big walls. It was impossible to capture the immensity of it all on our cameras. It had to be experienced to be understood. At the top, there were small groups and couples taking selfies and searching for shade. Chipmunks darted between our feet and dared to crawl into our backpacks, looking for food. The views were truly awe-inspiring. It was easy to hang out here for a long lunch. After finishing most of the descent, we reached a junction that sent us hurtling back uphill towards Hidden Canyon. This trail was interesting, with several sections of narrow slickrock traversing (with chains) and steps cut right into the stone. People were totally freaking out at the chained section, which meant it was super fun to walk across. The official trail ended at the mouth of the canyon, but the hike description urged us to walk further. There was just one or two sections of moderate scrambling to get over short walls of rock, then the rest was easy wandering between the canyon walls. We walked as far as a small rock arch, less than a mile up the canyon, and decided to turn around. It was here that I decided to go barefoot. It always feels so nice to stretch out the feet after hiking all day in trail shoes. We made one final detour before we returned to the shuttle. I had to put my shoes back on because this section was paved and the dark asphalt was burning hot. This stretch of trail was packed with tourists. That’s what you get for doing a quarter-mile long hike. The main attraction of this short spur is Weeping Rock, the site of the park’s famed “hanging gardens.” My brain conjured up an image much more spectacular than what lay ahead of us, so I found it to be a huge disappointment. We’d seen so much cool stuff today anyways; it was time to go back. The next morning we got up early so we could catch the first shuttle. All I’d read about Angels Landing was that it was the park’s marquee hiking attraction. Zillions of people would be aiming for this trail today, so the only way I’d go up there was if we could get a head start on the mob. We began this hike, thankfully, in the shade. It’s a steep climb right off the bat. Soon we reached the famed “Walter’s Wiggles,” a section of hairpin switchbacks cut right into the rock. They were brilliantly engineered to allow anyone with enough leg and lung power to hike up to the base of Angels Landing. Then, the fun began. At Scout Lookout, or chicken-out point, or whatever it is, people generally decide whether to proceed or not. Beyond this point is the notorious narrow trail section that has chains to hold on to. We were set on reaching the summit, and my goal was to proceed without using the chains at all. It was a beautiful walk with the early morning sun enhancing the red, orange and yellow hues on the rock. The trail was way more mellow than I was anticipating, and it never felt particularly scary or dangerous. Of course, if I were on this trail when it was loaded with people, I would definitely be concerned about the ability of the masses to safely negotiate others on this route. I was happy we were up here essentially alone. Before long we found ourselves on the upper trail. We passed one pair of visitors taking photos under a tree and walked out onto the end of the point for our summit snack break. We had the place to ourselves for quite a while, then an older Canadian gentleman joined us. It was a great perch to look down the canyon and feel the spaciousness of it all. But, not wanting to encounter the crowds, we packed up and headed out before most people had even stepped out of their RV’s. My favorite sight was the guy with the Coors Light t-shirt on. Or was it Budweiser? Either way, a man outside his comfort zone. While the trail was a bit disappointing, the scenery was not. I was glad to stop and take photos while people were passing on their way up. I was in awe of the size of the throng of tourists shuffling up the trail. We set our sights on the Grotto picnic area, where we’d take a break, re-pack, and hit the trail again. It wasn’t even 10 am yet. We had the whole day ahead. It was time for a chill barefoot hike. The Emerald Pools Loop looked like the perfect opportunity. My feet felt alive on the cool, soft sand. We walked slowly and quietly along the river, encountering a handful of groups along the trail. Once we got closer to the pools, the energy level heightened. We heard an enormous group of screaming children somewhere ahead. People of all ages, shapes and sizes made their way to the scenic pools. Water in the desert is always a main attraction. While there was ample, clear signage to stay out of the pools, several people disregarded the signs. There was even a woman smoking at the upper pool. Aah, the joys of visiting National Parks. Continuing along our hike we came to the Lower Emerald Pool, which I thought was the prettiest and most underrated of them all. Delicate wildflowers and ferns clung to the moist rock walls and sand around the pools. We could hear frogs calling from somewhere nearby. The air was cool and refreshing, the views out into the canyon beautiful. We continued on to the Lodge, where we stopped for a rest and some ice cream. Then it was a pleasant stroll through lush green foliage back to the Grotto, where we picked up the shuttle for a ride back to camp. Afternoons in Zion are crazy hot, even in April, so we sprawled out under the cottonwood tree in our campsite and spent a few hours recovering. After dinner, we packed back up for an evening hike up the Watchman Trail. This convenient trail head was located just outside our campground so we rolled out of camp and started up the trail. The best part of this hike was the profusion of wildflowers growing along the trail. I wished I had a flower guide with me to help identify these flowers. Later I discovered that we saw beavertail cactus, Eaton’s penstemon, Utah daisy and Thomson’s peteria, among other things. It felt like I was walking through a landscape painting. We stopped at the lookout point for sunset, where I got a phone call from my buddy, Rick. Weather was coming in, he said, and we were pushing the climb ahead a day. That meant tomorrow. We hiked out of there, rolled back into camp by headlamp, and started re-packing for the morning. 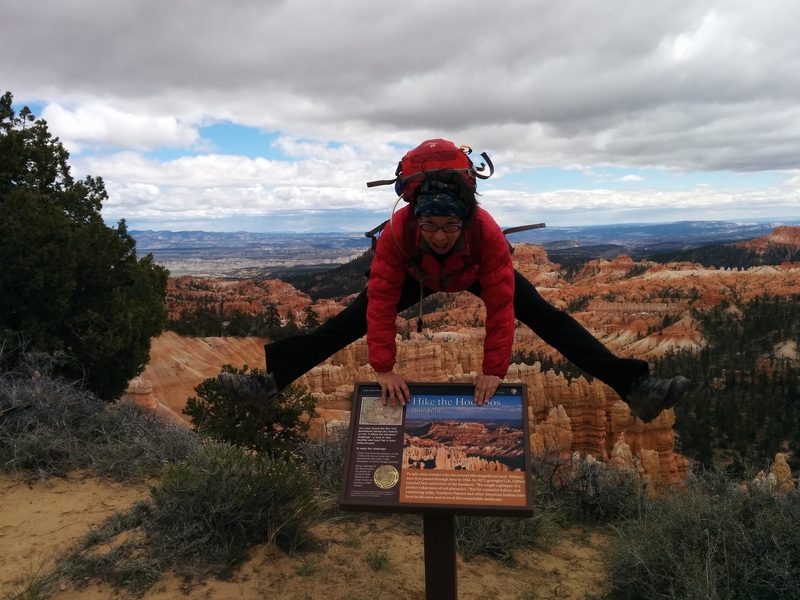 This entry was posted in Four state parks tour 2015, Hiking, Utah on April 26, 2015 by Jess B.